Star Trek U.S.S. Enterprise NCC-1701 Coaster Set:Each of the of 6 coasters in this Star Trek U.S.S. Enterprise NCC-1701 Coaster Set from Think Geek features a different layer of the ship so that when you put them all together, the whole vessel sits before you in 1 1/2-inch tall 3D! (A favorite view is when you take off the very top coaster, which allows you to see through the primary hull down into the saucer and nacelles.) 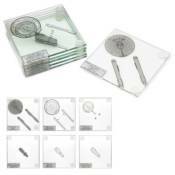 Each 4-inch square x 1/4-inch thick glass coaster also lists which of the Enterprise'sfeatures are detailed on it, and its silicon feet protect your table from the evils of scratches and condensation, even while exploring brave new worlds like boba or kale smoothies! Ages 14 and up. Don't you just love the Enterprise?She's such a majestic ship, tearing through space at warp speed like it's nothing. But beneath that shiny unruffled surface, everybody's favorite Constitutionclass vessel is incredibly complicated. Do you enjoy technical drawings? Do you need to drink liquids to survive? Well then, mammal, you're in luck. All three are combined in this Star Trek U.S.S. Enterprise NCC-1701 Coasters Set! Hand wash only. Not dishwasher safe. Ages 14 and up.